Subarachnoid hemorrhage (SAH) is a clinical condition with acute-onset, sudden, and severe headache. In addition to headache, severe nausea, vomiting, dizziness, confusion, agitation, focal neurologic deficits, and hypertension can be detected. Findings of meningeal irritation may accompany to these clinical features, 6-24 hours after the hemorrhage. Digital subtraction angiography (DSA) is used for surgical or endovascular treatment planning in order to identify vascular abnormalities, in addition to other imaging studies. 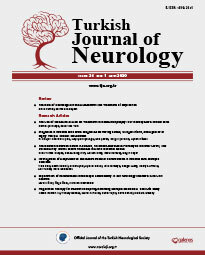 After DSA, the frequency of all neurologic complications is between 0.2% and 4.5%. Headache may occur after DSA in an average 50% of patients. This rate is especially higher in female patients. Headache types are usually classified as migraine, tension or postoperative atypical headaches The incidence of severe headache after DSA is low. Vascular wall rupture should be considered first in severe headache after the procedure. It should also be kept in mind that after all other secondary causes are excluded; SAH-like headaches after DSA can be detected.